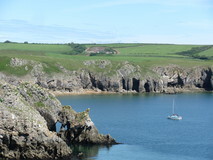 After the two very successful trips in 2013 to do the first two installments of the Wales Coast Path, I was keen to get going again, particularly since the next bit took in the Pembrokeshire coast, which I knew from a previous trip back in 2006 to be superb walking. It was a bit of a trek to get all the way back to my previous finish point at Cardigan, and required some careful organisation to avoid wasting a large part of a day travelling. So I had a cunning plan to take all my walking stuff with me to work, then leave straight from there at close of play to catch a train to Carmarthen, then stay in a B&B overnight and get the first bus in the morning to Cardigan. The evening journey to Carmarthen went smoothly, and I was even able to get a seat on all three separate train connections, arriving at Carmarthen before ten. Then it was straight down to the bus station for quarter past seven the next morning, to catch the bus, which arrived at Cardigan just before nine. 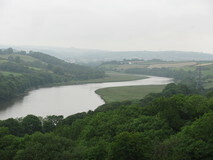 I was keen to get cracking, so I didn't hang about, and from the bus stop I walked straight down to the bridge across the River Teifi where I rejoined the path. 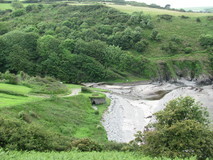 There were a few grassy fields, that were wet with dew, to get to St Dogmaels, and then a section on the road to Poppit Sands, although it was fairly quiet for traffic. I had been really looking forward to a good breakfast stop at the cafe, but when I got there I found it didn't open until eleven, so I was an hour too early, which was a bit of a blow. 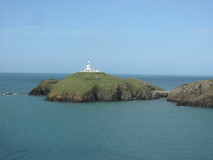 I pushed on up the road hill, past the YHA and some yurts, to get to Cemaes Head, where there were excellent views ahead, all the way to the distinct whale-like lump of Dinas island. 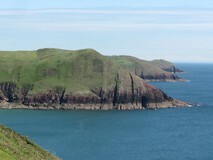 Looking back I could also see the pointy hill of Mwnt, that I had passed by on the final day of my previous trip last September. 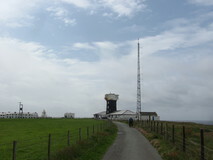 The Weather wasn't too bad, it was a bit dull, and quite breezy, but dry. 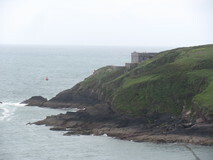 Shortly after Cemaes Head I sat down on some steps on a bit of the path that was sheltered from the wind and had half a Clif bar and some nuts and raisins, to make up for the missing breakfast. 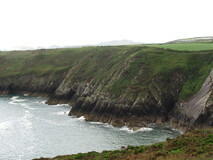 The section between Cemaes Head and newport had some great scenery, with each new headland trying to outdo the last with even more wiggly strata. 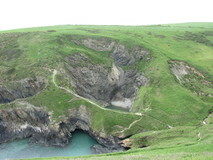 Then I arrived at the superb witches cauldron, where the path crossed a narrow ridge between the sea and a pool where an old cave had collapsed. 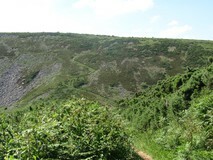 There was a sign just before the cauldron warning walkers that the following seven mile stretch was 'remote, rugged and challenging'. 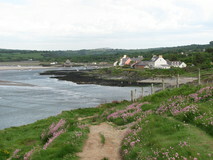 It was fairly quiet along here, and I only saw about eight walkers in total between leaving Cemaes Head and arriving at Newport Sands. I reached Newport itself at about half past four. I was feeling a bit peckish, so I took a short detour up the hill into town where I found an excellent organic cafe. They had stopped serving food about half an hour ago, but took pity on me and knocked up a houmous and salad baguette and a pot of leaf tea. 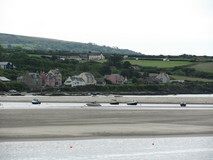 I pushed on past the pleasant waterfront at Parrog, with a cluster of small cottages overlooking the boats on the sandy beach alongside the river. 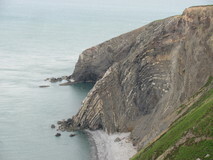 The cliffs changed in character from those earlier in the day, the rough layered rock was replaced by smooth slate cliffs, often vertical or overhanging, and usually topped with pink flowers. 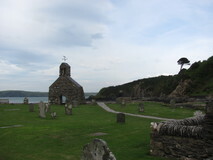 After passing the remains of the church at Cwm Yr Eglwys, I headed out to do the circuit of Dinas Island. 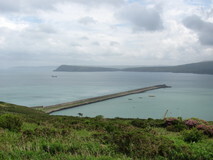 At the trig point at the far end, sweeping views suddenly opened up to Goodwick. At the end of the circuit, there was a sign for camping, which took me uphill on a small farm road. Last thing in the day the extra climb was a bit unwelcome, but I was rewarded by a pleasant camping site, with the whole site to myself! I brewed up a pan of tea, followed by curry flavour instant noodles, then after a piping hot shower I was tucked up in my sleeping bag by ten o'clock. I got a reasonable start in the morning, and after dropping back down the hill I was back on the path at quarter to eight. 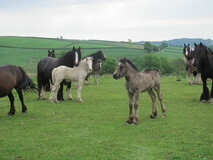 There had been a few showers overnight, but by the morning it was dry, although a bit dull. The long grass on either side of the path was very wet with dew though, which deposited itself on you as you brushed past, and after ten minutes I had to stop and put waterproof socks and overtrousers on. 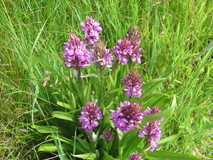 There were some good patches of orchids along here. 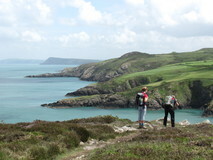 Nearing Fishguard I bumped into a chap going in the other direction doing the Pembrokeshire Coast Path, who reported that he had had good weather for the whole of his trip, apart from two hours of rain. 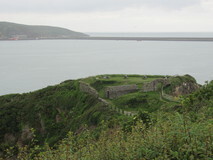 After crossing the river at Lower Fishguard, a concrete path traversed round the headland, with increasingly good views back to the Lower Fishguard harbour. 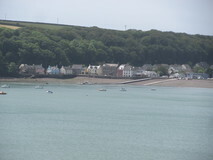 At Goodwick I adjourned to the cafe at the Ocean Lab for a late breakfast of beans on toast and a pot of tea. Looking at the map, the next stretch didn't seem to have a lot of facilities, so I stocked up with some extra instant noodles, malt loaf and nuts from a small supermarket. 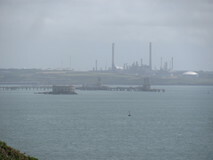 There was a heavy rain shower as I left Goodwick, but it passed over very quickly, and from then on it was mostly sunny. 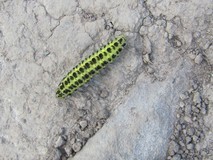 From the outskirts of Goodwick, the walking was pleasant, past rocky headlands, through ferns and gorse, and I even spotted a lizard darting across the path, and further on two seals in the water. 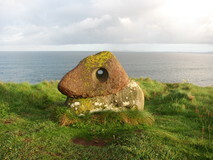 At a stone marking an attempted French invasion in 1797 I sat down for a snack, and laid my waterproofs out to dry from the earlier shower. 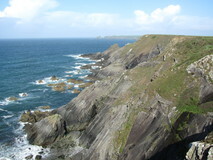 More good walking took me to Strumble Head, where there some cars parked and a few people about, and I sat down in the sun and had a quick muesli bar. As I passed Pwll Deri Youth Hostel I popped in and topped up my water bottles, which were getting quite low. 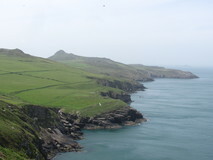 There were superb views back to the YHA as I pushed on along the shoulder past Carn Ogof. 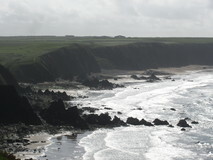 I reached the rocky beach at Abermaw at quarter past six and stopped for half a Clif bar. 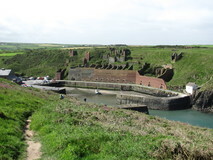 I was feeling a bit weary by this time, but the last section to Abercastle was fairly flat and easy going. At Abercastle there was a B&B that did a bit of camping on the side, but unfortunately it was closed for a couple of days. Luckily there was a place nearby that normally did week long camping bookings only, but they just happened to have a spot that was between bookings and empty for one night and let me pitch up and use the showers. After pitching up, I felt a bit dehydrated and overheated, which I put down to not drinking enough for the last couple of hours. I drank quite a bit of water, which eventually improved things, although it took a couple of hours before I was able to face any food. I slept very soundly, and even missed my alarm, but was woken up anyway by the sun at half past seven. I got de-pitched and was back on the path at eight. After Trefin there were a few more people on the path. 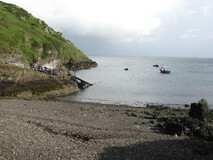 At the small harbour at Porthgain I filled up with water from the WC just as a chap was arriving to clean them. 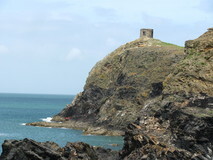 I pushed on to Abereiddy, with a short detour to see the blue lagoon, in an old flooded slate quarry. An ice cream van had just pulled up at the small car park, but unfortunately wasn't open yet. I topped up with water from the WC and bumped into the chap doing the cleaning again, who had just arrived in his van. 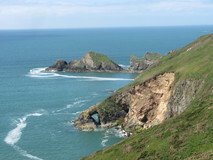 The next stretch was excellent, impressive views back to Carn Penberry with the rather imposing cliffs below dropping down to the sea. 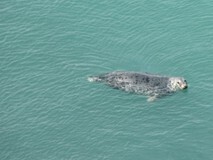 I spotted a seal below in a small bay, and then the next moment there were seven of them, with their heads out the water, and I could have sworn they were all looking at me. Near St David's Head the path picked its way through large rocks and slabs. 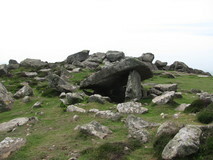 The path was a bit indistinct here and I was surprised that I actually managed to find the remains of the Neolithic tomb. 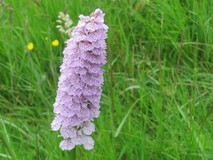 There were lots of orchids scattered around here. 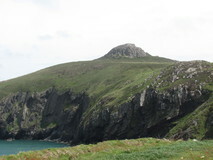 The path soon dropped down to Whitesands bay, where there was a small cafe, which I remembered from doing the Pembrokeshire Coast Path. 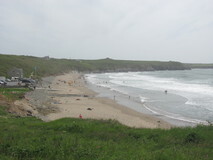 There were quite a few surfers out in the water, although the waves looked a bit lacklustre. I was ten minutes too late for food, but I got a pot of tea and snack, followed by some cold fizzy drinks too. Up to now, it had been dry all day, with a stiff breeze that made it change from sunny to cloudy every few minutes, but aftre Whitesands it changed to constant blue skies and sunshine. 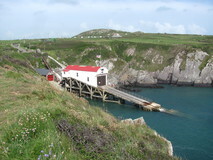 There was an impressive lifeboat station at St Justinians, perched on legs just above water level. A little further on were two black birds with orange beaks and feet, that I suspected were choughs, although unfortunately I wasn't quick enough to get a photo of them. 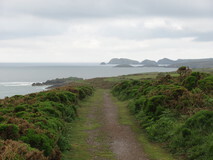 This stretch was almost deserted all the way to Porthclais, which appeared quite suddenly. 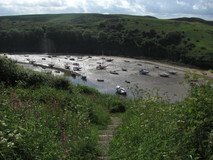 I dropped down to the long narrow harbour, then took the short walk up the road to the campsite. The site was quite spacious, there were two sizeable fields, and not many people about, and I was pitched up and sitting in the evening sun with a pan of tea by quarter past seven. It was raining when I woke up, and I needed full waterproofs on when I first got going. I was back on the path at twenty past seven. There were lots of snails on the path. The rain soon eased up and then seemed to be mainly holding off, apart from a couple of showers that passed by. 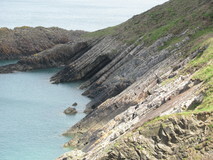 There was some amazing strata along this stretch, huge folded slabs where the layers were exposed. 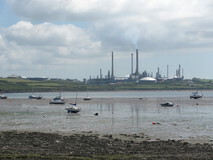 I noticed the tips of refinery chimneys appearing off in the distance for the first time. After a couple of hours the sun made an appearance. 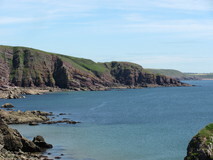 There were good views ahead to the huge sweeping coastline of St Brides Bay, and I could literally see the weather on the move, as patches of sunshine gradually made their way along the coast. At Caerfi I passed a campsite with two luxury yurts quite near to the path, which had their own gas bottles and solar panels outside. By nine it had dried up enough to take off my waterproofs. 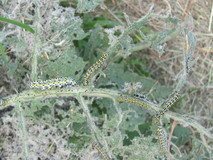 The walking was easy going, on grassy path, through rather dead looking gorse, and occassional bushes. 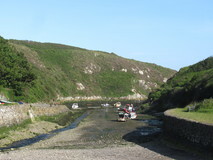 Solva suddenly arrived, and I followed a pleasant flower lined path down to the harbour. 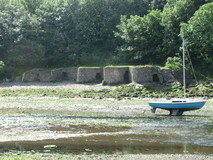 After a quick look round Solva I pushed on, past a impressive row of old lime kilns. 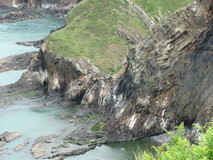 There were some superb inlets with towering cliffs surrounding them. 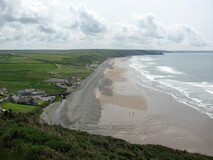 At Newgale I adjourned to the cafe for beans on toast and a pot of tea. Beside the beach was a very new looking road where the old road and the protective shingle bank had apparently been washed away in the storms earlier in the year. Near an old chimney, a huge dragonfly went past, and I spent a fruitless five minutes trying to get a photo of it, but it just wouldn't stay still for any length of time. The path round here had shiny black stones embedded in it. At Nolton Haven two swimmers in wetsuits were heading out for a circuit of the bay, although they were hampered by their six collie dogs trying to follow them into the water, and they had to shoo them back. 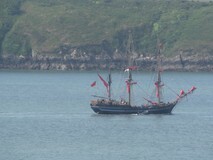 They made good progress though, and by the time I had climbed up to get above the harbour they were already out at the edge of the harbour. After Nolton Haven I passed an intriguing tellytubby like house that was half buried under the grass. Shortly after the teletubby house I bumped into a chap from Vancouver going in the opposite direction, and also camping. 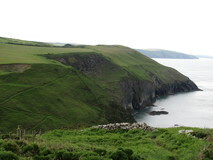 We stopped for a chat and compared notes on the coast path, and other trails in the UK, Europe, and beyond. 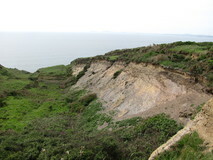 Nearing Broad Haven I passed by an area where there was an old landslip, with a large earth bank exposed. 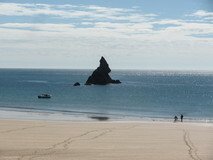 At Broad Haven I stocked up on supplies at the small supermarket, and sat down and had a couple of sport drinks and a snack. 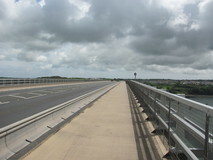 There was a road section between Broad Haven and Little Haven, with no pavements, but fortunately it was fairly quiet for traffic. 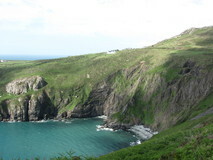 After Little Haven there was a delightful stretch, on narrow path, hemmed in by tall grasses, ferns, and wild flowers, high above the sea, with steep fern covered hillside dropping off down to the sea below. 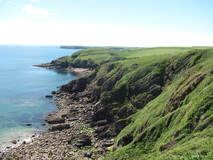 There were superb views back along the wide sweep of St Brides Bay, and I could spot all the places that I had passed earlier in the day, with the white houses and buildings gleaming in the evening sun. It was easy going, fairly flat, so I was able to breeze along without too much effort. I eventually turned inland at Mill Haven for the camping. The site was a bit further than I expected, the position of the little tent icon on the OS map was a bit misleading, and I was beginning to wonder whether it was such a good idea, but evenually it appeared, about a mile away from the path. It was a nice spot though, with a small number of pitches, and very quiet. I had instant noodles with added cashew nuts, followed by fruit bread for tea. 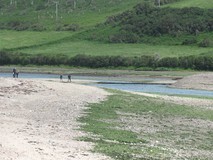 Today's section had two tidal crossings, the first one just after Dale, then another one at Sandy Haven. 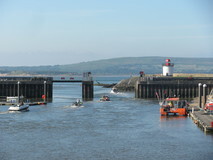 After checking the tide times I was fairly sure that I could make the first crossing with a decent early start, but the second one seemed unlikely unless I started walking in the middle of the night! I got going just after six, it was raining and I needed full waterproofs on. 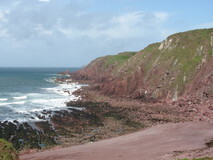 The scenery had changed from the day before, and I was now on red mud path, with red sandstone cliffs below. 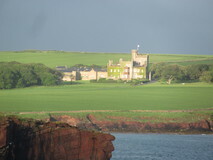 A castle appeared in the distance at St Brides, which seemed to have its own little patch of sunshine amongst all the surrounding dark grey clouds. 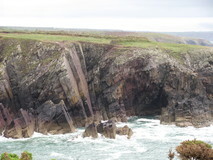 There wasn't much at St Brides Haven but I stood in a lime kiln to get out of the rain and had half a Clif bar. A slight blister was starting to appear on my left foot, the first one so far on the trip, and I stuck a compeed on it. I reached Martin's Haven at twenty to nine. 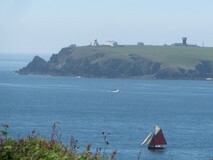 There were quite a few people about, waiting for the boat to Skomer Island. There was a tap here, so I was able to top up my water. 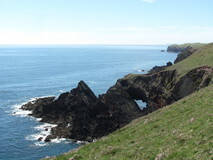 From here the route took wide grassy path, mostly flat and easy going, often with interesting cliffs below, and remnants of the old airfield inland. The sun had come out by now, so I was able to take the waterproofs off. The path passed by the neck of the peninsula, which was actually quite narrow, and I could see Dale just a few minutes away along a small valley. The coast path went round the whole peninsula to reach Dale though, so I pushed on to the rather weather beaten buildings at St Ann's Head. 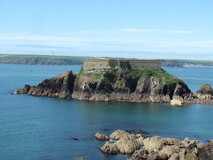 From the path there good views back to the fort at West Blockhouse Point shortly after passing three tall light beacons. At Dale I topped up with water and pushed on. I was in good time for the Gann, so it was still well uncovered. 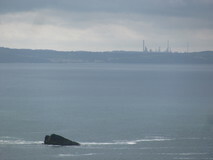 The stretch between the Gann and Sandy Haven was very quiet, and there were increasingly good views of the refineries across the water, with the small fort on Stack Rock Island sitting in front of them. There were a few sections through trees on this stretch, which was a nice change. 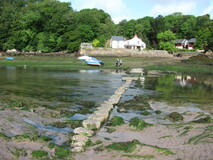 I reached Sandy Haven at half past two, which was three and a half hours after low tide, so as expected the stepping stones were already well covered, and I couldn't even spot where they went. I headed inland to St Ishmael, and adjourned to the pub to decide whether to wait until the evening and cross over or stay in St Ishmael and cross in the morning. I made some enquiries, and there turned out to be a place at the top end of the village which did occasional camping, which settled it. The site was fairly basic, it only had space for two tents, and a portaloo with cold water but no showers. 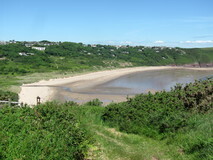 Perfectly adequate though, and the cheapest yet since the start of the whole Wales Coast Path, only two pounds! I got depitched and walked back down the road to Sandy Haven, arriving at quarter to nine. It was already nice and sunny, and I laid the tent out to dry while waiting for the stepping stones to become uncovered. The tent barely had time to dry out before they appeared, and I crossed over at nine. I started off along a wet grassy path, and needed waterproof socks on to keep my feet dry. 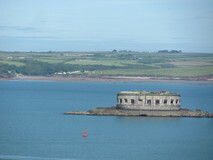 There were good views of the circular fort out in Milford Haven, and a sailing ship with red masts glided by. Further along the path dropped down to pass under a massive jetty. 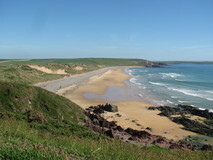 I finally reached the outskirts of the town of Milford Haven at Gelliswick bay, where there was a public toilet, so I was able to fill up my water bottles. I bought a few provisions at a small corner shop as I passed through the outskirts of town. While I was packing them into the rucksac outside the shop, two elderly chaps, one who was on a motorised scooter and the other who was 88 years old, came over for a chat and were interested in where I was heading. 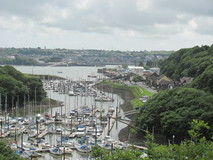 After passing Milford Haven harbour there was a grassy viewpoint area with a bandstand and some statues, and I sat down and had a snack while taking in the view. 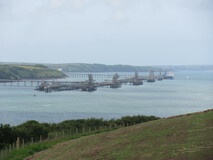 After leaving town, the route passed over Black bridge, which I remembered from doing the Pembrokeshire Coast Path as having a slightly dodgy road section. Things seemed to have improved though, as there was now a non-road route. 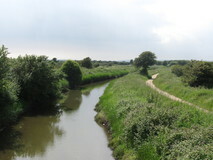 It headed off from the bridge along the river bed of Castle Pill, which seemed a bit odd, but then soon joined a proper path, which led uphill away from the Pill. 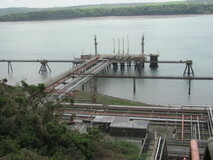 Some farm track followed by grassy meadows got me back down to the waterside, where the path skirted a large oil refinery, with good views over Milford Haven, and occassional covered bridges to cross over over sets of pipelines. The section after Neyland confused me a bit, I was expecting to pass by the sailing club, where we had enjoyed a nice cafe stop when we did the Pembrokeshire Path, before then climbing up to the large road bridge on steep zig-zags. 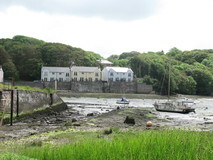 However it seemed to have been rerouted along a residential street, then through a short stretch of forest to gradually climb up to the Cleddau Bridge. 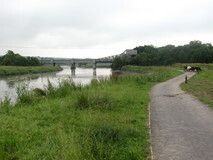 The bridge is actually two separate bridges, one across Westfield Pill, then a second much large one across the River Cleddau. 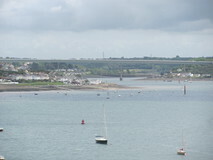 Crossing the bridges, there were excellent views over Neyland Marina, and then further on views down the length of Milford Haven. 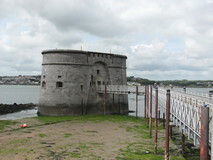 After crossing the bridges, the path dropped down to Pembroke Dock, passing by the Martello Tower, and I stopped on a bench and had a quick snack. The route soon climbed out of town, before suddenly coming to the impressive old barracks building, with great views back down over the town. Shortly after leaving Pembroke Dock was a field with lots of rather inquisitive bulls in it, and I breathed a sigh of relief when I made it out the gate at the other end. Until I realised that I had come out the wrong gate, so had to go back in and walk through them again up the field to find the proper gate. 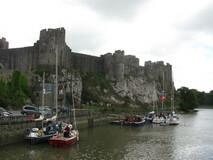 I finally popped out at Pembroke Castle at quarter to five. It was a good point to stop, despite being a bit early, so I stocked up on a few more bits and pieces from a supermarket in the main street. Then I walked up the hill on the busy road, but with decent grass verge, to the campsite. It was a nice site, and fairly quiet, and I was pitched up with a pan of tea ready by six o'clock. Browsing over the map and guidebook for the next day, it looked like there wouldn't be any camping places in the vicinity of Castlemartin, and limited opportunities for any wild camping too, as it was all in the firing range. 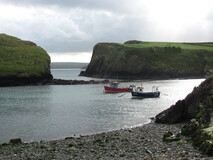 So I rang up and booked a place in a B&B, in Merrion which was a couple of miles after Castlemartin. The tent was on the side of the field that caught the morning sun, so I got woken up before my alarm, and after the walk back down the hill to Pembroke I was back on the path at quarter to eight. 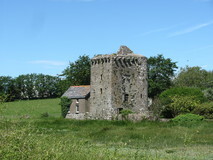 I was hoping for some good views of the castle on the way out of Pembroke, but there weren't any and the route just headed through a housing estate, followed by quite a few fields, with the odd nice forest stretch and strong smells of wild garlic. 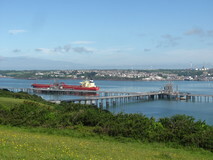 After passing the entrance to a power station, the route gained some height and traversed across a pleasant wide grassy area, skirting round an oil refinery, with good views looking out over the jetties and moored ships in Milford Haven. 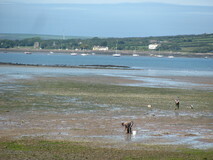 There was a long road stretch skirting round Angle Bay, and I could see a few blokes digging out on the mud of the bay. I arrived at Angle at midday and I grabbed some sports drinks from the small village shop, which I polished off sitting at a small table outside. 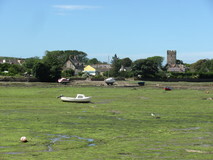 Leaving Angle there were nice views looking back towards the village, with the tide out and the small boats sitting on the mud and dried out green weed. 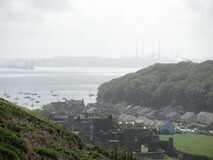 After Angle Point there were more good views across Milford Haven, and I could see back to both Sandy Haven from yesterday and Dale from the day before. The views of the refinery towers, which I had first spotted way back at St Bridges Bay, finally disappeared too. 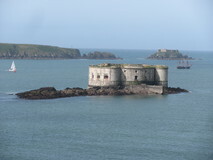 There was an intriguing fort on Thorn Island, which for a while had apparently been used as a hotel. I reached Wavecrest Bay at half past one. It was quite busy, including a coach load of kids. I remembered a small cafe here from doing the Pembrokeshire Coast Path, and was really looking forward to stopping for some food. But the cafe seemed to be out of action, with building work going on inside, and a sign in the window that said 'Opening in June', which was a huge disappointment. 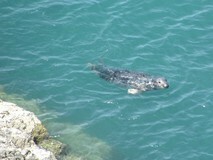 I sat in the shade of the toilet block and had a snack instead, while watching the comings and goings. I pushed on towards Freshwater, this stretch was very pleasant, almost totally deserted, with a few steep climbs out of small valleys but nothing too taxing, and clear turquoise waters below colourful headlands of red, brown and black rock. At Freshwater Bay there were lots more people about and I stopped for an ice lolly, then sat down and cooked up some instant noodles with added cashew nuts for an early tea. I could hear explosions in the distance coming from the firing range. 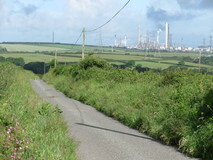 Leaving Freshwater, the route took to minor roads to Castlemartin, as there is no access to the coast due to the firing range. 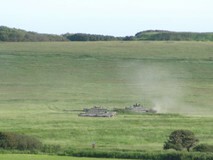 I reached a viewpoint at Warren just in time to see a load of explosions and smoke from two tanks as they fired a salvo of shots. As I got to Merrion, three tanks were just arriving, on the back of huge transporter lorries. I finally reached the B&B at quarter past seven. The explosions carried on until nine o'clock, and every time one went off, all the windows in the house rattled! Breakfast was at eight o'clock. 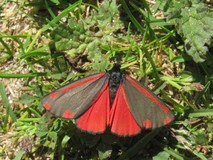 There was one other couple in the B&B, who were keen long distance walkers, who were going in the same direction. They had all the information about the firing range, and it turned out that the section from the Green Bridge along the coast to St Govans Chapel was closed today, which was rather unfortunate as I remembered some good scenery from doing the Pembrokeshire Coast Path. I got going at half past eight, and had to take the alternate route, which followed the road and then a few field sections to get to Bosherton. At Bosherton there were signs for camping, and a fairly basic setup with a nice large field and a few portaloos, which I could probably have reached the previous day if I had known the coast section was going to be closed. 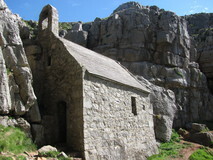 I wasn't quite sure whether the bit from St Govans Chapel past St Govans Head would be open or not, but I headed down the road anyway to take a look. Also heading down were a group of teenagers with large rucksacs on, with camping mats attached to them, until one of them announced that they were going the wrong way, and they all turned round and headed in the other direction. The road went past a sentry box which was unmanned, which seemed promising, and sure enough I was able to get all the way down to St Govans Chapel, which was totally deserted, so I was able to have a good look around and get some shots. I pushed on along the coast, on track first of all, then on wide grassy path, surrounded by flowers and ferns, it was easy going so I was able to breeze along. At St Govans Head there were some superb cliffs, together with a selection of rusting abseil posts on the top for climbers. 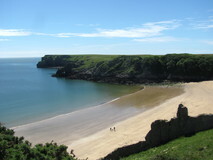 Near Stackpole Quay there were a few more people milling about, and I adjourned to the cafe for a pot of tea and a snack. A chap in running gear appeared in the cafe, who was apparently running the whole Wales Coast Path in thirty days! 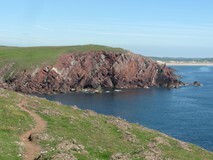 From Stackpole Quay the path wiggled its way along, past a lumpy iron age fort. 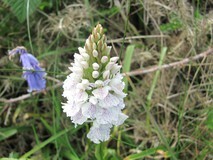 Leaving Freshwater East it was slow going on sandy path, but with superb orchids lining the path in places. Descending to Swanlake a chap went past in the other direction with a massive rucksac on, which even had a small frying pan hanging off the side. 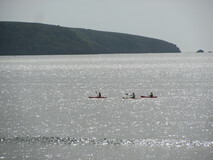 It was quite hot going, and I was going through plenty of water, and I topped up yet again at the WC at Manorbier Bay. 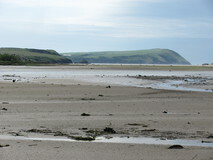 It was quite busy with people at the bay, and yet five minutes away on the path it was deserted again. 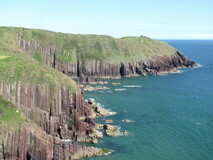 There was superb vertical strata after Manorbier, with occasional narrow vertical clefts where a single layer of the strata had been worn away. 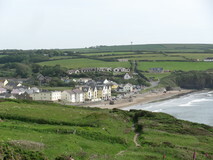 At Lydstep I went through a large holiday camp, before joining the beach for a while. 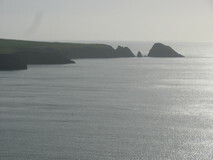 There were nice views of the evening sun on Caldey Island. Round here I came across an intriguing plant, very tall, but which had been attacked by a load of rather well fed looking caterpillars, leaving it almost down to a skeleton. Near Penally I reached a small high point with a flagpole where I could look down inland over the campsite, it looked really busy with rows upon rows of caravans, but I walked down, arriving at half past six. The attendant wasn't around, but there was enough space to pitch up, alongside the two other tents on the site, and then I settled up when the attendant got back. I woke up before the alarm, it was one of those very welcome 'no-condensation' mornings, where I was able to pack up a nice dry tent. I walked back up to the small high point with the flagpole, arriving back on the path just before eight. 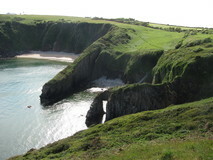 The route soon dropped down to the long beach leading to Tenby. 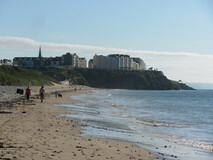 A couple of swimmers in wetsuits went past in the sea, and I passed some large fishes and a few jellyfish on the beach. 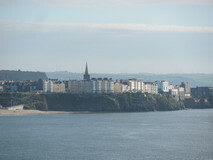 I arrived in Tenby at quarter to nine. The chemist was already open, and I stocked up with extra suncream, which I was going through rather quickly, and some extra compeeds. 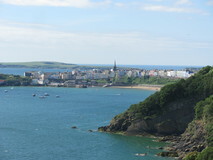 I also got some instant noodles and a few bars at a small supermarket, then adjourned to a nice little cafe and had a pot of tea and toasted teacake sitting on a small balcony overlooking the harbour. The cafe was a bit too comfortable, and I didn't get going again until almost ten. 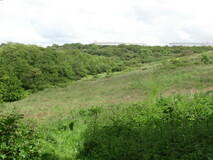 There were some pleasant wooded sections with some ups and downs through little valleys, and occasional views back to Tenby through gaps in the trees. 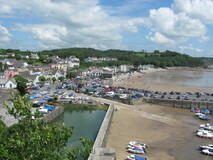 As it was a Saturday, Saundersfoot was very busy, and there was a brass band playing. I got a couple of sports drinks and polished them off, then pushed on, through a set of narrow pedestrian tunnels that emerged on a promenade that led to Wisemans Bridge. 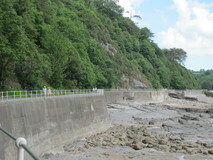 A little bit of road walking followed by a concrete path got me all the way to Amroth at half past twelve. After the usual routine of filling up with water in the public toilets, followed by applying more sun cream, I pushed on, alongside the stony beach of Amroth, to reach the plaque marking the start of the Pembrokeshire Coast Path. 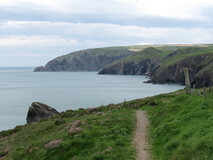 I had been on relatively familiar terrain up to now, having done the Pembrokeshire path on a previous trip (albeit quite a long time ago and in the other direction), so I was now back on unknown terrain again. 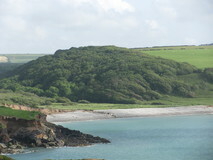 The next stretch passing Marros Sands was good walking though, almost completely deserted, traversing across the hillside through thick bushes, ferns, and patches of trees, and views out over the massive empty beach. 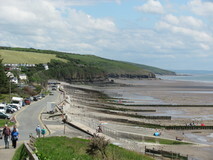 After turning a corner at Gilman Point, the path dropped down a lot of steps to come out right on the promenade at Pendine. 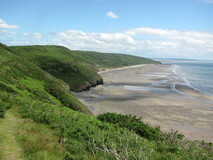 It had been quite hot on this section, the path along the hillside was a bit of a sun trap, and I had gone through two litres of water between Amroth and Pendine. I topped up with water, and had a couple of sports drinks before pushing on. The path now headed away from the coast on a cycle path beside a fairly quiet A-road. 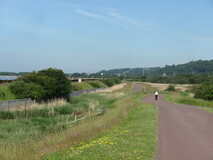 The cycle path eventually ran out, and the route took to field edges, sometimes on open fields and sometimes in fenced off corridors along field edges. 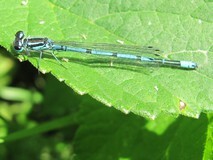 There were lots of damselflies along some of the fenced in sections. Somewhere along here I felt something spiky in my shoe, which turned out to be a long thorn that had gone right through the sole of my approach shoe, through the sorbothane insole, and was now sticking up between two of my toes. It was very tough, like a small nail, and stuck fairly solidly, but I managed to push it back out by pressing on it with a coin from inside the shoe. At Plashott, the path disappeared and there was a section without a pavement along the A-road, although it wasn't too bad as there was a bit of a verge that was freshly cut, and the road itself was fairly quiet. Eventually I turned off the road and took a gravel farm track alongside a tree covered hillside, which was nice and quiet, and quite pleasant in the evening sun. Further along the path took to the forest, where there were some notice boards describing how Dylan Thomas had been inspired by the views from this point. 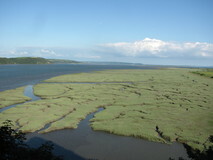 A superb view appeared over the light green salt marshes, and further on excellent views of Laugharne Castle across the marshes. 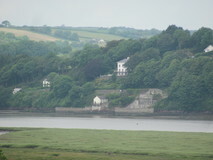 Laugharne itself was a pleasant spot, and there were lots of people milling about, and sitting on picnic benches in front of the castle, beside the little inlets. I bought a few supplies in the shop, and bumped into the chap who had created the Dylan Thomas notice boards, who introduced himself, and was pleased to hear that I had enjoyed both the views and the boards. 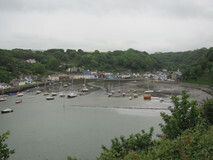 From the town, a circuit round Delacorse, passing Dylan Thomas's Boathouse got me to the campsite, which was only a few minutes off the path. As it was a Saturday, and sunny, and a Wales rugby game, it was packed out, but they were able to squeeze me in. I woke up before the alarm, and was back on the path by seven. 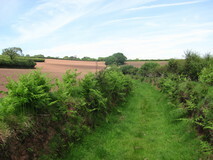 It wasn't that far to St Clears, via a combination of fields and fenced off corridors along field edges. In places the path was almost swallowed up by tall grass that was very wet with dew, so I needed waterproof trousers and socks on for this bit. 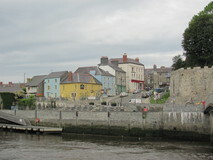 At St Clears I sat on a bench beside the Old Motte, and had a muesli bar for breakfast. After St Clears there was quite a bit of re-routing compared to the map in the guidebook, taking a very quiet road, to replace some field sections that were described in the book as being boggy with inquisitive bulls, so I wasn't too disappointed to miss them. 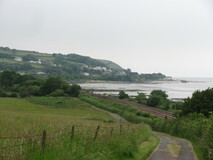 There were large metal coast path signposts at most road junctions, so the re-routing was fairly easy to follow. 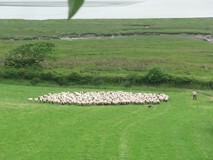 Near Pentowyn I stopped for ten minutes and watched a chap with a sheepdog in a field down below gathering together a huge flock of sheep. 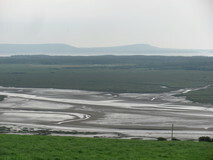 After all the inland walking on roads and fields it was nice to reach Wharley Point, which felt like proper coast path again, and there were good views across the estuary, where the three separate rivers of the Taf, Towy, and Gwendraeth all came together. So far it had been dry but cloudy, which had been good for walking, but now the sun appeared and it got quite a lot hotter. 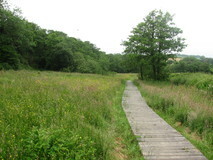 There was a nice stretch through a forest, before dropping down to Llansteffan, arriving at one o'clock. The village was quite busy, centred around a big car park with some rather ropey public loos, but I stopped at a small cafe and got a pot of tea and a toasted teacake. Leaving the village there was a nice bridleway section, which went on for quite a long way, starting off sunken below the surrounding fields, then wide grassy path between hedges and bushes. I arrived at Llangain at quarter past four. There was a pleasant small campsite here, and didn't appear to be much in the way of camping opportunities on the route ahead in the vicinity of Carmarthen, so even though it seemed a bit early to call it a day, I stopped and pitched up. 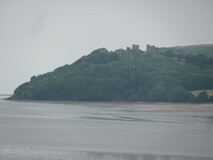 It was a good spot, nice and quiet, and a bit of a contrast after the busy Saturday night camping at Laugharne! I got going at half past six, on a mix of easy lanes, and some fields. Nearer Carmarthen the route joined a riverside path along the River Towy, past some horses and later some cows that had free reign over the path and surrounding grass. 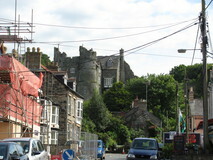 I arrived in Carmarthen at twenty past eight. I was hoping for a decent cafe for a breakfast stop, but I couldn't find anything, so I got a few supplies from a small corner shop and pushed on. 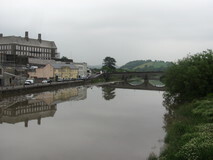 The path crossed over the River Towy on the pedestrian bridge to the railway station, which I recognised from when I arrived in Carmarthen by train eleven days ago. 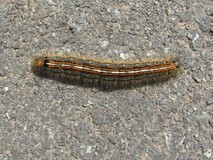 The route followed a pavement along a road through various out of town shopping parks. The weather had been fairly dull so far, but now it started drizzling, and I had to put full waterproofs on. 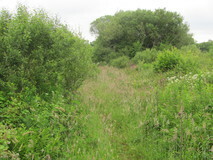 I carried on following the route along roads, which got progressively smaller, until finally turning into a farm track. 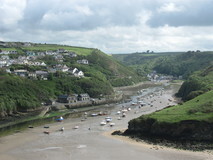 The weather seemed to have dried up a bit by the time I arrived at Ferryside at quarter past twelve, and I adjourned to the cafe for baked potato and baked beans, and a pot of tea. 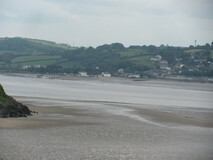 There were good views back across the River Towy to Llansteffan. 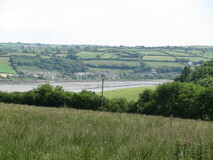 From Ferryside the path took a number of fields, the signs were a bit sparse, so it required a bit of concentration on the map. 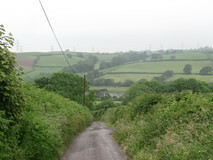 After Llansaint, the route descended, first on a small road, and then farm track, with great views over to Pembrey Forest, and on to the Gower beyond. 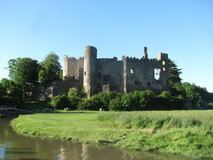 At Kidwelly I took a short stroll up the river to go and look at the impressive castle. There didn't seem to be much in the way of shops in town, but there was a small newsagent, and I got a couple of sports drinks, and some extra instant noodles. 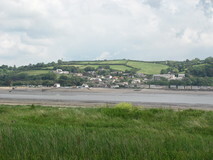 The route left Kidwelly and went out past the railway station to Kidwelly Quay, which was a nice spot, so I stopped for a muesli bar and some peanuts and raisins at some picnic tables. The sun was starting to make an appearance by now, so I put some suncream on too. 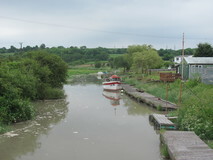 From the quay was a pleasant stretch along an old canal, with lots of greenery along the banks. After so much road walking during the day, I was looking forward to Pembrey Forest, but there turned out to be a diversion signposted, due to flooding earlier in the year, which was a pity. If I had followed my own advice and checked route changes on the official WCP website ahead of the trip I would have known about it of course! 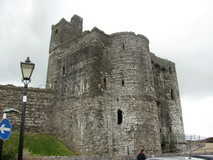 The diversion took quiet roads, and I bumped into two women going in the other direction who asked me how far Kidwelly was, and what the castle was like. They only had a map from a car atlas, and had set out from Llanelli following the Wales Coast Path signs, so were relieved that it wasn't too far off. The small road eventually turned into singletrack through grass, which was pleasant enough, although it seemed to go on a long way, and I was quite relieved when Wales Coast Path signs finally reappeared. 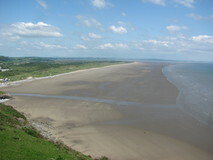 I reached the far end of the diversion, near the entrance to Pembrey Forest, at six o'clock. The signs at the entrance to the forest didn't seem very encouraging, with camping apparently for 'pre-arranged groups only', but I walked down and it turned out to be fine, plenty of space, in a nice grassy area surrounded by trees, and the campsite attendant even gave me a discount for having a small tent! I got a nice early start, and was back on the path at twenty past seven. It was already warm and sunny. 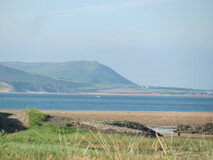 Easy gravel path past dunes led to Burry Port, where I sat down on a bench and had a muesli bar for breakfast, and put some sun cream on. 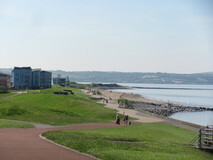 The route now followed the Llanelli Millenium Coastal Path, taking a reddish tarmac path that went through pleasant landscaped grassy areas, and passing a few large ponds. 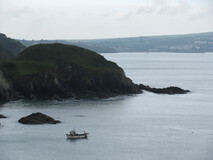 Further on, two swimmers wearing wetsuits went past in the sea. I reached some new looking waterfront flats followed shortly by a bridge over North Quay, at ten o'clock. This was the logical point to leave the route to go and catch the train from Llanelli station. 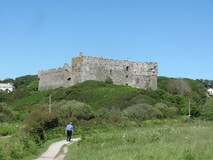 But I was enjoying the easy walking in the sunshine, with the nice views out to the Gower, and it seemed a shame to stop. I had a quick look at the map to see if there was anywhere else I could push on to for a few extra hours. But the only possibility was Bynea station, which seemed to have only one train every five hours, so that settled it. A quick walk up to the station, and thirty minutes later I was on the train home. 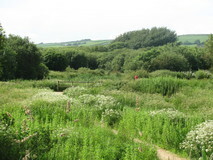 As I recommended after the second installment of the path, it is worth checking the official site for any changes to the route, Of course I completely failed to do this myself, so was taken by surprise by the route changes after St Clears, and the Pembrey Forest diversion. 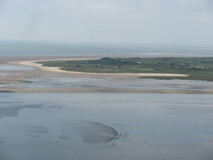 As of July 2014 it looks like the Pembrey Forest diversion has gone, and there is a new route which takes in part of the forest before heading along the beach, which should be far better. So I was just a month too early! This now leaves me with only 280km (174 miles) left to finish the whole Wales Coast Path. My next installment will hopefully be later in the year, and will be on the Gower Peninsula almost straight away, which should be excellent quality. After the Gower, the final stretch along the South coast looks like it passes quite a bit of industry, and a few cities, and must have been quite challenging to sort out a route, so I am intrigued to see what it will be like. Update: As it happened the final section didn't have to wait long at all, and I got it done a few weeks later, in July, from Llanelli to Chepstow.